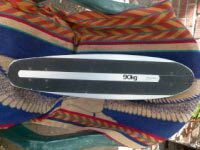 1976 - Early 1977 Sims Quicksilver 90kg Slalom Skateboard Deck. Flexible Aluminum with Hard wood core. 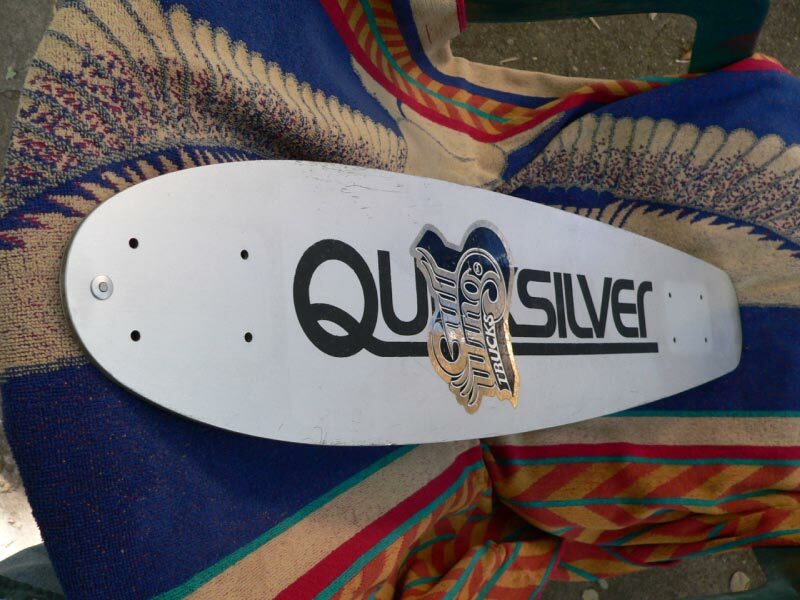 George Powell created the Quicksilver Skateboard and marketed it under Sims. This is the original Sims version... from 1976 - Early 77. The Quicksilver had 3 degrees of flex. 50kg, 70kg and 90kg. This is the gnarly 90kg flex. Deck measures 28" x 6.5". This is a first generation SIMS QUICKSILVER skateboard deck from the mid 1970's. It is the 90kg model, and is 28 5/16 " long by 6 5/8" wide. It is the original first generation SIMS version, before Powell. This one has the original engraved name, in this case "Aloha Surf Shop" and the painted SIMS logo on the top. It does not have the rivet in the nose that came later when Powell got involved, although I added one later to protect it from delaminating. It has done it's job. It comes with original grip tape in tact, plus two small strips I added at the front and tails between, when it was new for added traction. The large foil Gull wing sticker is still present. I did not want to risk damaging paint below by removing improperly. Someone who know what they are doing can, I am certain. Many collectors do not even know that SIMS was the original distributor of Quicksilver. This one is unique, especially with its history. 90 kilograms multiplied by 2.2 = 198 pounds. 70 kilograms multiplied by 2.2 = 154 pounds. With all my checking, I know that this exact board was being riden by me no latter than Feb in 1977, well prior to Powell product takeover. I cannot say will certainty if it was produced in late 76 or early 77. My brother's Surf Shop where I go it was about one hour from Sims headquarters in Santa Barbara, CA, making them one of the cloosest Sims dealers. Here are a few additional images taken with a higher quality camera. Click to see enlargements. 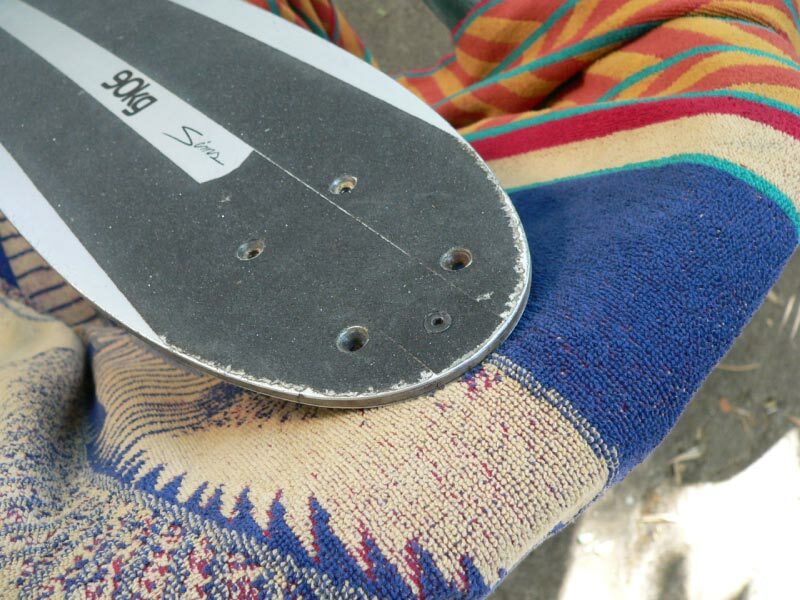 These show detailed condition of deck including minor nicks and scratches. Some minor chips on the black paint on the bottom have been touched up in the past. These were mostly lttle specks, most were pin prick - sand grain sized. I used this board when designing Aloha Skatetown. Traveled with group, collected comments and advice. Constructed models of runs…promotions, planning commission, engineering. Soils geologists, engineers, and contractors to assist in bid process and understand the design. Learned about Gunite and Shotcrete , Rebar, soil expansion, etc. "In the grand scheme of things, Carlsbad was America's first skate park," he said. "It really was the pre-emptive park. ... You can really make a case that this put Southern California on the map." Reseda - SkaterCross - an old fast food drive-in with a single great run underneath its canopy, with a fast drop-off to lead you in. Fresno - flew to Fresno, took bus to rare indoor skatepark. Jungleland, Thousand Oaks - alligator pools, etc. Mirage Dry Lake, near Space shuttle landing area, with sail - see image of WindSkate. Q:A couple of months ago, Chris Solomon and I discussed the relationship between Tom Sims and George Powell concerning Powell's "Quicksilver", aluminum skin, maple core deck. Sims marketed Powells' Quicksilver deck in the spring of 1977.In the summer of '77, Powell introduced the Quicktail and Bones wheels. 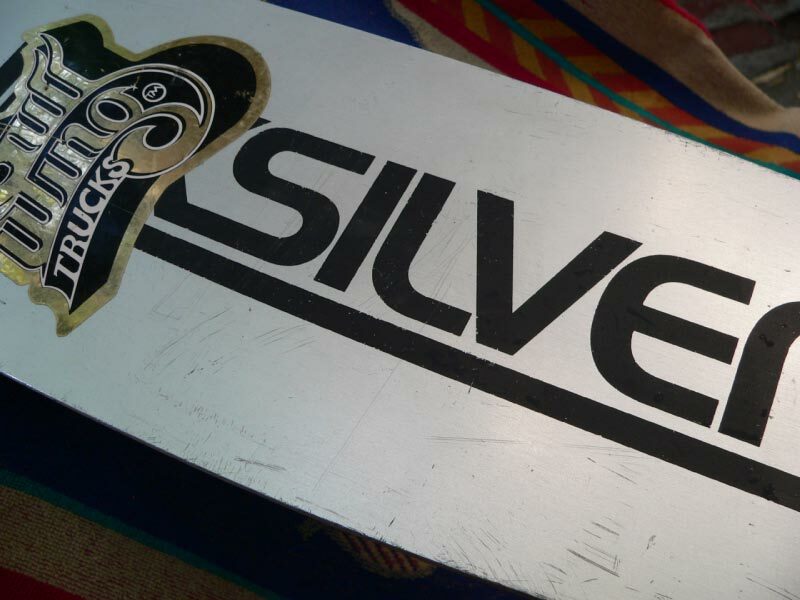 .By September '77, Sims dropped the Quicksilver and Powell took over Quicksilver marketing. For the first correct answer(s) the winner will receive a December 1977 Skateboarder magazine. (Bob Biniak interview) Remember if you know the answer tell a kid and share some skate history. A: TOM- I was just looking at this Dec.`77 issue before we put it in the mail. Low and behold,there's a letter from Chris Yandall in it. PAT- Man you sound like your Grandmother, "low and behold". What does he say? TOM- My Grandmother would take offense to that. Yandall writes about graphite laminations. Quite a lampoonish letter. 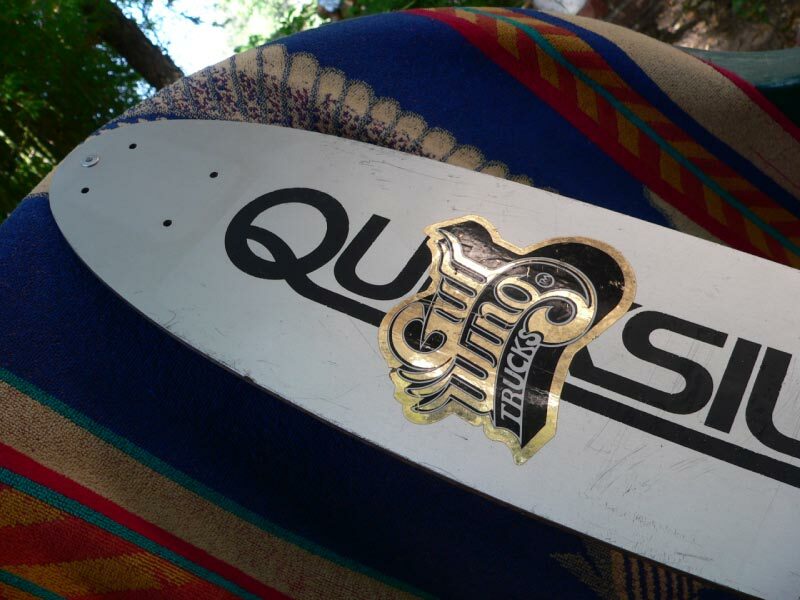 TOM- George Powell said Stacy Peralta was so stoked with the pump of this board, that he offered to buy one on the spot. PAT- I thought someone would get Peralta sooner. TOM- Me too. What about the answer? PAT- Sorry. Stacy Peralta and Paul Hoffman. The parking lot at Palisades High was called the Horseshoe due to its shape. TOM- Wasn't the first proto an aluminum honeycomb core? PAT- Did I forget to tell that? TOM- Yeah. Buddy talked to us about Mike Williams racing a Quicksilver. PAT- So we checked it out. TOM- For flatland slalom Mike used a 70kg, for downhill tight slalom he used a 90kg, and for giant slalom he used a stiffer 72cm or 84cm Quicktail. PAT- The third clue was to be; which skater left G&S to join Hobie and help design their "Park Machine"? TOM- What about the second clue? Did Paul Hoffman make any money off of Leroy Neiman's painting? PAT- I don't know but I bet the owner of the photo did. It was taken at the Concrete Wave in Anaheim. There were 5000 prints made in `78, at a cost of $60 each. TOM- There was another skater at the Horseshoe that day, named Jose Gallan. PAT- I don't know anything about this skater. Can someone help us out? TOM- Our winner is Bill Butler of Phoenix, AZ. We think he may have had some help from a collector in Germany. PAT- Our offer to European skaters still stands. Log on and talk to us and we will send you a mag and shirt. TOM- Bill your mag is in the mail. Thanks for playing. All content © 2001, 2008 R. D. Nelson. All rights reserved.